This was the Blazers' third game in four nights and the second one of a back-to-back, coming straight off a loss against the reigning NBA champions Warriors the previous night. 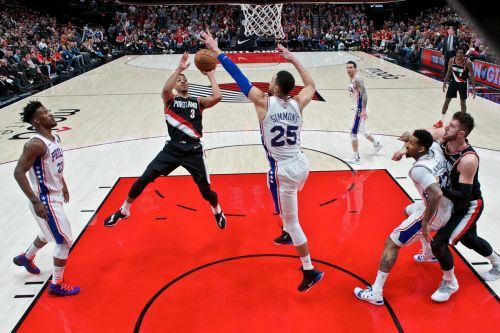 However, what transpired at the Moda Center against the visiting Sixers was nothing short of sheer will and the conviction to win on any given night despite the circumstances or schedule. The Trail Blazers routed a Joel Embiid-less Philly side from tip-off to the final buzzer and pulled out an imposing 129-95 blowout victory from the bag. Yes, the Sixers missed their best player (left knee soreness) on the court, but the way Portland bested them has exposed numerous quirks in the Philly way of basketball when the Cameroonian is not available. The win was Portland's sixth in the last ten games, as they hop back up to the West's seventh spot with a 21-16 (0.568) record, improving to a majestic 14-6 at home. The Sixers, on the other hand, have now lost five of their last ten matchups, slipping to 3.5 games behind the East-leading Bucks. Philly's win-loss record currently stands at 23-14 (0.622) at the fourth spot out East. Let's draw out some key takeaways from this C.J. 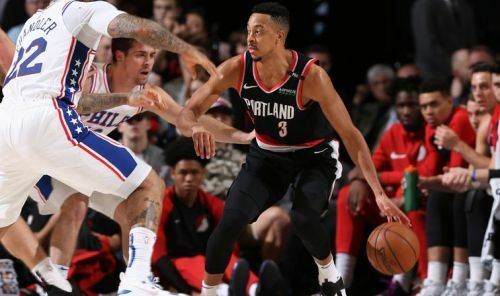 McCollum-led Blazers' lofty win over the Embiid-less Sixers. “I felt like I was missing shots. I felt like I was, you know, getting some of the same looks that I’ve been getting my entire life and I wasn’t making them,” McCollum said. "I've been getting some of the same looks I've been getting my entire life, and I wasn't making them." Nothing actually changed for Portland's starting shooting guard on Monday except that the ball was just falling through. In just 28 minutes of work, he finished with a game-high total of 35 points, shooting a familiar 13-of-18 from the field, and making four of his seven three-point attempts on the night. This was the sixth instance when CJ had recorded a 30+ score and would have likely crossed 40 points had he played in the final quarter.